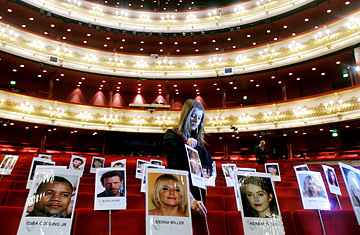 Bolstering the argument that today's stars are a little flat: The setup for the British Academy Film Awards ceremony at The Royal Opera House in London. The Golden Globes  Who Cares? Pity the poor BAFTAs. For a moment there, it looked like the annual awards of the British Academy of Film and Television Arts were going to be the only celebration of film that mattered this season. The U.S. writers' strike had already reduced the Golden Globes to a glorified checklist, and as long as negotiations were a standoff, the Oscars were no sure thing, either. Yes, the Screen Actors Guild awards had gone ahead as planned, but that doesn't resonate much beyond U.S. borders: a SAG award gets you back pats from showbiz pals, but it won't sell your film in France. So it looked like last night's ceremony in London would be the only chance for A-listers to dress up pretty, glide down a red carpet and subtly remind viewers around the world that their latest film will soon be available on DVD. This was going to be the year that the British Academy finally stepped out from behind its American cousin's shadow. But it wasn't to be. Instead of the rollicking glamfest that everyone hoped for, this year's BAFTAs played out more like a dress rehearsal for the real thing. Maybe it was the 11th-hour turnaround on the strike negotiations, which cleared the way for a full-on Oscars ceremony Feb. 24 and gave Hollywood's big hitters an excuse to save the price of a plane ticket. Or maybe it was just the inevitable comedown after all the hype. But last night's ceremony at the Royal Opera House was less star-studded than star-sprinkled and lacked the energy you'd expect from an awards show that almost had the spotlight to itself. There were some undeniably big names in the audience  Daniel Day-Lewis, Keira Knightley, Anthony Hopkins, Kate Hudson, Ridley Scott, Ian McKellen  just not enough of them. After the first three rows, the faces became unfamiliar. Many of the high-profile nominees  George, Cate, Tommy Lee  were no-shows, and it quickly became clear that many famous attendees were there either to present an award or pick one up. Everybody had a job to do; nobody had just come for the party. Not that it was BAFTA's fault: all it can do is send out the invitations and keep its fingers crossed. There's no excuse, though, for the limp material that host Jonathan Ross, the BBC's high-priced answer to Jay Leno, was tossing out all night. His running gag  that the writers' strike had left him with nothing but a bunch of lame puns  is a shtick Leno used months ago. And it doesn't make sense anyway, since Britain's writers aren't on strike. The evening's evidence does suggest, though, that in sympathy with their U.S. counterparts they just gave up trying. But while the ceremony was a disappointment, the BAFTA awards themselves could teach the Oscars a thing or two about the big, wide world of film. As the American Academy slowly, begrudgingly learns to accept the fact that other countries make great movies too, the British Academy has fully embraced the idea that all cinema is world cinema and that some of the best films are made in places where English is the foreign language. So France's La Vie En Rose and The Diving Bell and the Butterfly, Germany's The Lives of Others, and The Kite Runner, with most of its dialogue in Farsi, competed against the likes of Atonement, No Country for Old Men and There Will Be Blood for a whole slew of awards instead of being relegated to the Film Not in an English Language category. Which is how The Diving Bell and the Butterfly, an adaptation of stroke victim Jean-Dominique Bauby's autobiography, beat out the screen version of Ian McEwan's Atonement for best adapted screenplay. And how newcomer Marion Cotillard  who played Edith Piaf in La Vie En Rose  nabbed the best actress award that was all but already on Julie Christie's mantelpiece. The upset has British awards-watchers seething and might have left Christie a little peeved, too: on Monday morning she was quoted in the free daily Metro calling the BAFTAs "a night for the media to fill gaps." In all, there were few surprises. Oscar shoo-in Javier Bardem picked up the award for best supporting actor, thanking "the mommy and daddy of [directors], Joel and Ethan Coen." The Spaniard acted as if he really wasn't expecting to win, despite having already won every award going  and probably some that haven't even been invented yet  for his villain in No Country for Old Men. The leading actor award went to Daniel Day-Lewis, whose speech seemed designed to show everyone that he's not really as scary as he comes across on screen in There Will Be Blood: "Some of us put away childish things and some of us don't ... and [actors] need playmates, otherwise we're just playing with ourselves  and I've worked with some people who prefer to do that." Tilda Swinton won best supporting actress for her role in Michael Clayton and promised to give the award to her agent (wonder if she'll be as generous if she wins an Oscar). And the producers of Atonement now have another best picture statue to keep next to their Golden Globe. The trouble is, all this just feels like a way to pass the time until the Big Day. The British Academy already tried to make the awards more relevant by moving them from a few weeks after the Academy Awards to a few weeks before, but with the Oscar voting all wrapped up and nothing left for Hollywood to do but wait to see who wins, the BAFTAs still come off as the Almost Oscars. Why not move the BAFTAs to a slot before the Oscar voting deadline? That way there's at least a chance that what happens at the BAFTAs might actually make a difference. If an Oscar voter is sitting on the fence about a film, a BAFTA win could push them one way or the other. Of course, then there's the problem of trying to convince the silver screen elite to come to London in the middle of winter. There's only one solution: move the ceremony to Los Angeles. The British Academy already has an arm in L.A. and so many British actors and directors live in the States anyway. If Hollywood won't come to the BAFTAs, take the BAFTAs to Hollywood.